Wieland Arlt is an active trader and trading coach/trainer. In 2014 his first book, "Risk and Money Management", was published. His second book, "55 Reasons to become a trader: why trader is the best profession in the world" was published in 2017. Available (for free) from Wieland Arlt in the NanoTrader trading platform. The most dangerous moment in trading. The first loss is always the smallest. Do not fear a sideways market – this is how you handle phases without trends. The exit is more important than the entry. 5 Tips to become a good trader. A grip on risk and return. As a trading coach and trainer Wieland puts the focus on trading strategies which are easy to explain and simple to implement. These strategies are supplemented by a strict risk and money management. In his Torero Traders school Wieland provides a professional training followed by in-depth coaching. The objective is to make traders independent and permanently successful. 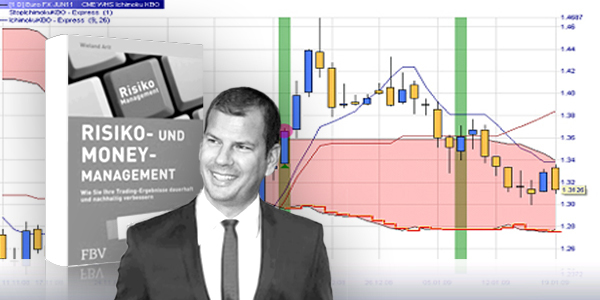 Expander is Wieland Arlt's favourite trading strategy. It can be used on all instruments and in all time frames from 15 minutes upwards. In this trading strategy the Bollinger bands are combined with a selection of candlestick patterns. When the candlestick patterns occur outside the Bollinger bands, the trader may consider opening a position. An open position is bracketed by a stop and a profit target. The stop loss is not static. It is based on the high-low of the previous periods. Uniquely the target is not static either!. The target follows the Bollinger bands in an attempt to capture the most profit from an open position. This is called a trailing target. This example shows a short sell signal. The trailing stop loss is already below the entry point. This trader cannot lose anymore. Notice the unique trailing target. The target automatically moves away from the market price in order to maximize profit. Download a free platform demo. Trailing profit targets are available in the NanoTrader trading platform. They can be combined with any trading strategy. All trades executed by the Expander trading strategy are visible in real-time in the SignalRadar table. The trades are not only visible in the trading platform but also in the free SignalRadar app. Boost your trading... test the free NanoTrader demo.